Okay, this posting is going to be a lot longer and a little more technical than the average MAFL blog (and it's not as if the standard fare around here could be fairly characterised as short and simple). Anyway, over the years of MAFL, people have asked me about the process of building a statistical model in sufficient number and with such apparent interest that I felt it was time to write a blog about it. Step one in building a model is, as in life, finding a purpose and the purpose of the model I'll be building for this blog is to predict AFL victory margins, surely about as noble a purpose as a model can aspire to. Step two is deciding on the data that will be used to build that model, a decision heavily influenced by expedience; often it's more a case of 'what have I already got that might be predictive?' rather than 'what will I spend the next 4 weeks of my life trying to source because I've an inkling it might help?'. Expediently enough, the model I'll be building here will use a single input variable: the TAB Sportsbet price of the home team, generally at noon on Wednesday before the game. I have this data going back to 1999, but I've personally recorded prices only since 2006. The remainder of the data I sourced from a website built to demonstrate the efficacy of the site-owner's subscription-based punting service, which makes me trust this data about as much as I trust on-site testimonials from 'genuine' customers. We'll just be using the data for the seasons 2006 to 2009. The first statistical model I'll fit to the data is what's called an ordinary least-squares regression - surely a name to cripple the self-esteem of even the most robust modelling technique - and is of the form Predicted Margin = a + (b / Home Team Price). The ordinary least-squares method chooses a and b to minimise the sum of the (squared) differences between the actual victory margin and that which would be predicted using it and, in this sense, 'fits' the data best of all the possible choices of a and b that we could make. This model fits the data for seasons 2006 to 2009 quite well. The most common measure of how well a model of this type fits is what's called the R-squared and, for this model, it's 0.236, meaning that the model explains a little less than one-quarter of the variability in margins across games. But this is a difficult measure to which to attach any intuitive meaning. Better perhaps is to know that, on average, the predictions of this model are wrong by 29.3 points per game and that, for one-half of the games it is within 24.1 points of the actual result, and for 27% of the games it is within 12 points. These results are all very promising but it would be a rookie mistake to start using this model in 2010 with the expectation that it will explain the future as well as it has explained the past. It's quite common for a statistical model to fit existing data well but to forecast as poorly as a surprised psychic ('Jeez, I didn't see that coming!'). Why? Because forecasting and fitting are two very different activities. When we build the model we deliberately make the fit as good as it can be and this can mean that the model we create doesn't faithfully represent the process that created that data. This is known in statistical circles - which, I guess, are only round on average - as 'overfitting' the data and it's one of the many things over which we obsess. Overfitting is less likely to be a problem for the current model since it has only one variable in it and overfitting is more commonly a disease of multi-variable models, but it's something that it's always wise to check. A bit like checking that you've turned the stove off before you leave home. The biggest problem with modelling the future is that it hasn't happened yet (with apologies to whoever I stole or paraphrased that from). In modelling, however, we can create an artificial reality where, as far as our model's concerned, the future hasn't yet happened. We do this by fitting the model to just a part of the data we have, saving some for later as it were. So, here we could fit the 2006 season's data and use the resulting model to predict the 2007 results. We could then repeat this by fitting a model to the 2007 data only and then use that model to predict the 2008 results, and then do something similar for 2009. Collectively, I'll call the models that I've fitted using this approach "Single Season" models. Each Single Season model's forecasting ability can be calculated from the difference between the predictions it makes and the results of the games in the subsequent season. If the Single Season models overfit the data then they'll tend to fit the data well but predict the future badly. The first column, for comparative purposes, shows the results for the simple model fitted to the entire data set (ie all of 2006 to 2009), and the next three columns show the results for each of the Single Season models. The final column averages the results for all the Single Season models and provides results that are the most directly comparable with those in the first column. On balance, our fears of overfitting appear unfounded. The average and median prediction errors are very similar, although the Single Season models are a little worse at making predictions that are within 3 goals of the actual result. Still, the predictions they produce seem good enough. The Single Season approach looks promising. One way that it might have a practical value is if it can be used to predict the handicap winners of each game at a rate sufficient to turn a profit. Unfortunately, it can't. In 2007 and 2008 it does slightly better than chance, predicting 51.4% of handicap winners, but in 2009 it predicts only 48.1% of winners. None of these performances is good enough to make money since, at $1.90 you need to tip at better than 52.6% to make money. In retrospect, this is not entirely surprising. Using a bookie's own head-to-head prices to beat him on the line market would be just too outrageous. Most data, in a modelling context, has a brief period of relevance that fades and, eventually, expires. In attempting to predict the result of this week's Geelong v Carlton game, for example, it's certainly relevant to know that Geelong beat St Kilda last week and that Carlton lost to Melbourne. It's also probably relevant to know that Geelong beat Carlton when they last played 11 weeks ago, but it's almost certainly irrelevant to know that Carlton beat Collingwood in 2007. Finessing this data relevance envelope by tweaking the weights of different pieces of data depending on their age is one of the black arts of modelling. All of the models we've constructed so far in this blog have a distinctly black-and-white view of data. Every game in the data set that the model uses is treated equally regardless of whether it pertains to a game played last week, last month, or last season, and every game not in the data set is ignored. There are a variety of ways to deal with this bipolarity, but the one I'll be using here for the moment is what I call the 'floating window' approach. Using it, a model is always constructed using the most recent X rounds of data. That model is then used to predict for just the current week then rebuilt next week for the subsequent week's action. So, for example, if we built a model with a 6-round floating window then, in looking to predict the results for Round 8 of a given season we'd use the results for Rounds 2 through 7 of that season. The next week we'd use the results for Rounds 3 through 8, and so on. For the early rounds of the season we'd reach back and use last year's results, including finals. So, next, I've created 47 models using floating windows ranging from 6-round to 52-round. Their performance across seasons 2008 and 2009 is summarised in the following charts. Broadly what we see here is that, in terms of mean APE, larger floating windows are better than smaller ones, but the improvement is minimal from about an 11-round window onwards. The median APE story is quite different. There is a marked minimum with a 9-round floating window, and 8-round and 10-round floating windows also perform well. The top line charts the percentage of time that the relevant model produces predictions that are 3-goals or less distant from the actual result. The middle line is similarly constructed but for a 2-goal distance, and the bottom line is for a 1-goal distance. Floating windows in the 8- to 11-round range all perform well on all three metrics, consistent with their strong performance in terms of median APE. The 16-round, 17-round and 18-round floating window models also perform well in terms of frequently producing predictions that are within 2-goals of the actual victory margin. Again though to consider each model's potential punting value we can look at its handicap betting performance. On this measure, only the model with an 11-round floating window seems to have any exploitable potential. We now have 47 floating window models offering an opinion on the likely outcomes of the games in any round. What if we pooled those opinions? But, not opinions are of equal value, so which opinions should we include and which should we ignore? What if we determined which opinions to pool based on the ability of different subsets of those 47 models to fit the results of, say, the last 26 rounds before the one we're trying to predict? And what if we updated those weights each round based on the latest results? (The dynamic floating window model results are labelled "Dynamic Linear I (22+35)" and "Dynamic Linear II (19+36+39+52)" The numbers in brackets are the Floating Window model forecasts that have been pooled to form the Dynamic Linear model. So, for example, the Dynamic Linear I model pools only the opinions of the Floating Window models based on a 22-round and a 35-round window. It determines how best to weight the opinions of these two Floating Window models by optimising over the past 26 rounds. The mean APE results suggest that, for this performance metric at least, models with more data tend to perform better than models with less. 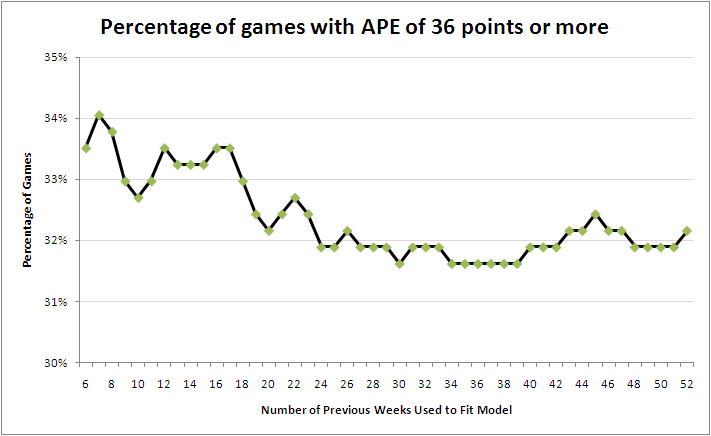 The best Dynamic Linear model I could find, for all its sophistication still only managed to produce a mean APE 0.05 points per game lower than the simple model that used all the data since the start of 2006, weighting each game equally. It is another Dynamic Linear model that shoots the lights out on the median APE results, however. The Dynamic Linear model that optimally combines the opinions of 19-, 36-, 39- and 52-round floating windows produces forecasts with a median APE of just 22.54 points per game. The next couple of charts show that this superior performance stems from this Dynamic Linear model's all-around ability - it isn't best in terms of producing the most APEs under 7 points nor in terms of producing the fewest APEs of 36 points or more. Okay, here's the clincher. Do either of the Dynamic Linear models do much of a job predicting handicap winners? Nope. The best models for predicting handicap winners are the 11-round floating window model and the model formed by using all the data since the start of 2006. They each manage to be right just over 53% of the time - a barely exploitable edge. What we've seen in these results is consistent with what I've found over the years in modelling the footy. Models tend to be highly specialised, so one that performs well in terms of, say, mean APE, won't perform well in terms of median APE. Perhaps no surprise then that none of the models we've produced so far have been any good at predicting handicap margin winners. To build such a model we need to start out with that as the explicit modelling goal, and that's a topic for a future blog.